A model of learning from positive and negative examples is naturally described in terms of Formal Concept Analysis (FCA). In these terms, result of learning consists of two sets of intents (closed subsets of attributes): the first one contains intents that have only positive examples in the corresponding extents. The second one contains intents such that the corresponding extents contain only negative examples. On the one hand, we show how the means of FCA allows one to realize learning in this model with various data representation, from standard object-attribute one to that with labeled graphs. On the other hand, we use the language of FCA to give natural descriptions of some standard models of Machine Learning such as version spaces and decision trees. This allows one to compare several machine learning approaches, as well as to employ some standard techniques of FCA in the domain of machine learning. 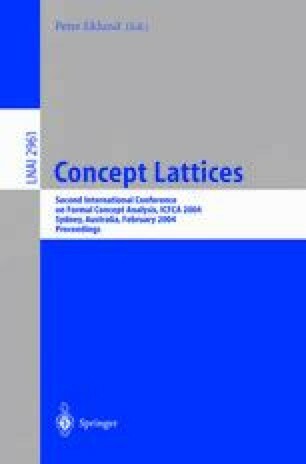 Algorithmic issues of learning with concept lattices are discussed. We consider applications of the concept-based learning, including Structure-Activity Relationship problem (in predictive toxicology) and spam filtering.